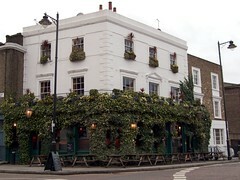 A pub in Barnsbury, almost hidden behind the vast amount of foliage which covers the building. It's run by the Capital Pub Company. Inside the large room is dominated by excessive ornamentation — all kinds of bric-a-brac, street signage, pewter tankards and the like hanging from the walls and ceiling, much in the style of the Sir Richard Steele in Hampstead. If anything, this pub is even more crammed with paraphernalia, and there's a lovely free-standing bar area as well. Tables line the outside of the room, with a few extra nooks and crannies to hide away in. Outside are plenty of tables for the summer weather, lined up along the street. On the bar are seven handpulls (five on one side, two on the other), with what appear to be a guest ale and four regulars in January 2009 -- Fuller's London Pride, Adnam's Broadside, Caledonian Deuchars IPA and Sharp's Doom Bar (these were much the same in August 2012, though they also had Purity Pure Ubu). Lager options are fairly basic, including Amstel. On a Saturday afternoon visit in January 2009, the two TVs on either side of the room were screening the football results, with the sound on (and turned up when something interested the bar staff) -- though not too loudly to be too distracting. Service is perfectly friendly, and the pub clearly attracts a regular crowd -- no bad thing, though: this is a quirky and attractive place. Food is served noon-4pm every day (including roasts on Sundays), with Thai food every evening at 6pm-10:30pm. Accessibility: Ladies' toilets are upstairs, though the gents are downstairs. Last visited by Ewan, Kerry, Kat, Sarah and others, August 2012. Opening hours and food times taken from website, August 2012. Last edited 2013-05-10 07:20:38 (version 5; diff). List all versions. Page last edited 2013-05-10 07:20:38 (version 5).